I'm not very good with Photoshop, and it's been a year or more since I last used it. I would probably use it more if I was faster at it, but lately I just don't seem to have much time to do the fiddling (hmm, I can't imagine why not!). It's a vicious circle, isn't it? Because if I worked with Photoshop and Illustrator more often, I'd almost certainly be quicker with them. Anyway, I just couldn't decide how the next dress should look, and it was fun to mock up several possible combinations. I still can't decide, however. Anyone feel strongly about one or the other? Here's an interesting story from NPR's Morning Edition last week about sewing machines and the industry's attempts to renew interest in home sewing. Also, J.Jill is holding a t-shirt design contest. Submit artwork of your favorite inspiration from nature, and the winning design will be printed on a limited-edition tee and sold as part of the Holiday 2006 J.Jill collection. 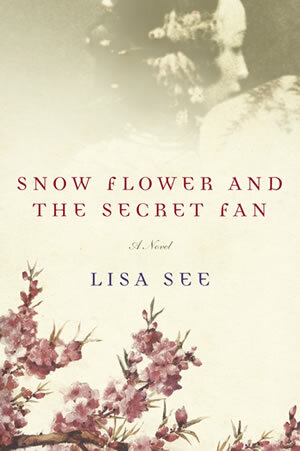 Just finished Snow Flower and the Secret Fan, by Lisa See, and I recommend it. It's a well written, historically-based novel about women in pre-revolutionary China and a secret written language that they developed. It's too bad that Snow Flower went back to the library so quickly, because she would have looked nice next to my first Lorna's Laces sock, finished at last. I know I should have chosen a simpler pattern for this variegated yarn, but I'm still really pleased with the results. I like the fit, I loved knitting the lace, and I'm happy to have managed the magic loop technique as well as the short rows. Sock number two will be going to Michigan with us next week. Bebe and I are leaving tomorrow morning to visit grandparents (hers and mine) for a week. We'll be back on Memorial Day. Have a great week! I like the 2nd and 4th dresses. Thanks for the tee shirt link. hi. I found your blog a few weeks ago and really enjoy it. I have a 20-month-old daughter and live in NYC, so I can relate to so many of your posts! I like the 2nd and 4th dresses the most, but they're all nice. I loved the skirt you posted the other day too. I would go with dress #3. I like the contrast between the blue top and the yellow piping. Love your blog. I like all 4 designs, my least favorite is #1. LOVE, LOVE, LOVE the dress. Would you conisder posting or selling your pattern? I like #2 best. 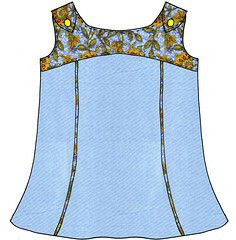 I like the colour contrast of the top in a solid and the piping in the same as it carries the colour through the dress. I like 2 and 3; I like the contrast between the yoke and the skirt; I like the patterned skirt because a pattern will cover those little spills that children (mine, anyway) are prone to better than a solid. i really like #2 and #3. i found your blog not too long ago and have been enjoying all of your craftiness :) love the skirt tutorial especially; i'm planning on trying it out soon. I like the solid at the bottom best. 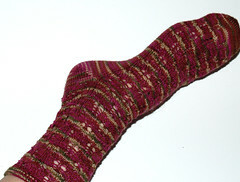 Your lace sock is gorgeous!! Hi liesl, I like #2 & 3 also...I found out hemming is hard! I had my husband help me but am not completely happy with it. I may have to rip it out and do it over.....its worse than frogging your knitting! what could be more cheerful than that? the dress is so so lovely. I love the flared skirt. 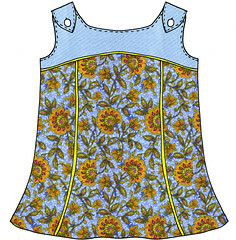 I really like the dress with the plain blue top and the yellow piping, #3. I just found your blog the other day and am really enjoying it very much. Thank you. I'm just learning to sew, so it's nice to be able to see what I'll someday know how to do. I like #3 the best. I think it has the best balance of color. I just found your blog the other day and am enjoying it very much. Thank you. I like #2 or #4 (only with the blue piping instead of yellow). What a sweet pattern! I like the 1st one, then the 2nd. Such good work! That is such a cute pattern. 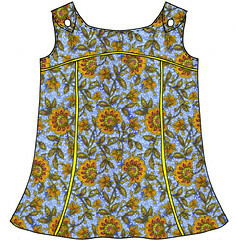 I like the blue top with flowered bottom and yellow piping! Number 3! The yellow piping is fantastic! Let's reschedule our get together when you get back. Our schedule is wide open for June! Have a nice visit with the family! I like the first and third dresses best. ^_^ You make me want to learn to sew even more *sigh*. Hopefully in a few weeks! Those dresses are so very cute!!!! I love them all, but my eyes are drawn to 1, 3, 4, then 2. I'm submitting another request for you to post and/or sell the pattern! i like dress #3 (yellow=very, very good), but as has been said -- they're all adorable! thanks also for the recommendation of so good for ribbon. i went there today and they were the best! they even gave my daughter loads of ribbon for free. I love the first one... but the third... with the yellow piping is wonderfully sweet. Just found your blog (from craftmedia.org) and I'm definately adding you to my blogroll. Please come add your blog to the BlogHer (http://BlogHer.org) blogroll, too. I love your blog. discovered it today and spent way too much time going through your WHOLE blog.